Another EDM event that Mountain has been working with for the past few years is the equally impressive Electric Daisy Carnival. EDC is a unique festival tour that stops at New York, Chicago and ends at Las Vegas. Its extraordinary environment draws sold out crowds and die hard fans from around the world. Mountain Productions set up various stages for the 2013 EDC tour in New York and Chicago, but the stage provided at the Las Vegas Motor Speedway turned out to be a landmark project for Mountain. Yesterday, Samsung hosted an interactive concert featuring a unique DJ experience and live fireworks triggered by audience members. Using the Samsung Galaxy S 4, viewers were able to prompt fireworks to go off during the performance, making the event a fun and great way to promote their product. Mountain Productions engineered and built the staging equipment at the Up Next event. 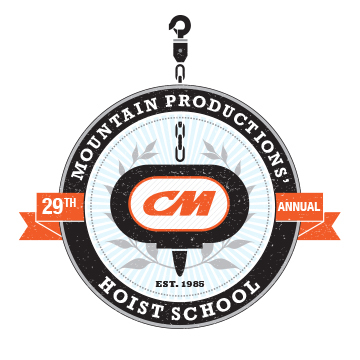 Mountain Productions is excited to announce that we will be celebrating our 29th year of CM Hoist School by extending the training to a full 5 days! We’ve listened to your feedback, and have added another day to our Hoist School, allowing for more time in rigging seminars and hands-on training. It’s the same quality education at a more comfortable pace. This is the first year in the Hoist School’s history that will host a 5 day session. Mountain’s custom turntable stage is a great staging option for unique venues and performances. Our turntable is a 60′ stage built on flat decks (or can even be operated on the ground if requested) and sits 19″ above the stage. 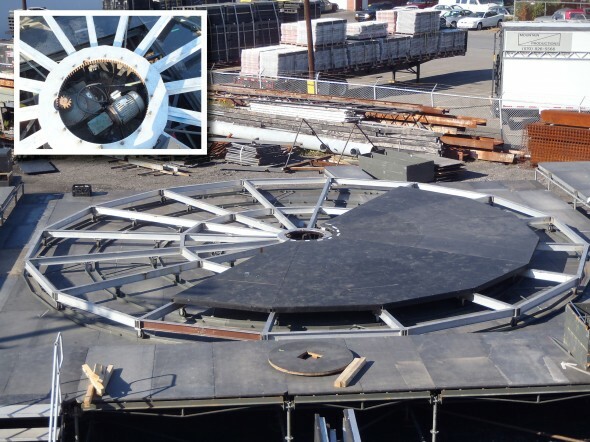 Custom corner filler decks complete the turntable stage, which can be move in either direction and at variable speeds. Recently, Mountain Productions brought the turntable stage to a sold out George Strait concert in San Antonio. A record breaking 73,086 fans were in attendance for the George Strait concert at the Alamodome, with special guests Martina McBride and Miranda Lambert.